There is a public transit stop right next to our location. We are happy to cater your event! We can do everything on our menu plus any specialty menu items you may desire. ROCKSALT is a seafood centric restaurant located in the Shops at Stonefield, Our goal is to support local brewers, farmers and artisans from both land and sea! We have 22 local beers on tap, some of them seasonal and rotating regularly, and a full bar! $5 Retro and vintage cocktails, swing music and oldie cocktail recipe contests. 1/2 off bottles of wine $50+ every Wednesday night! Don't forget about our Happy Hour daily 3-7 and all day on Sundays! Very slow service and bland, unimaginative food. I had swordfish and other diners had burgers. Vegetables-Brussels sprouts were bland too. Nothing was even tasty except for the seafood tower but they didn’t have enough mini forks to go around. The newly very limited menu is very different than what is posted on Open Table which is inexcusable in that it misrepresents the reality. Sloppily run restaurant and so I’ll never go back. WTH! Our server was excellent, but other than that, it was a rather lousy experience. The rest of the serving and restaurant staff were inattentive (and there were many of them there, and the restaurant was rather dead, and they were still inattentive) and the food was mediocre, particularly for its price (the oysters were definitely overpriced). Most notably, the menu was limited because they are in transition/waiting for the new executive chef to arrive. That information did not seem to be on their website, or at least not on the yelp page for the restaurant, so it was a disappointment to find that out upon arriving there for our reservation. Make sure you don’t confuse this with the large chain called rocksalt cross the country. 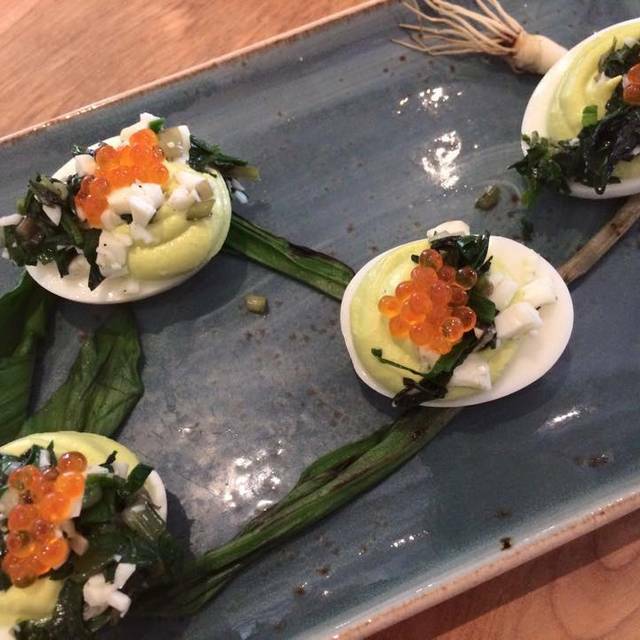 This is a locally owned restaurant with some locally sourced shellfish that is farm raised. 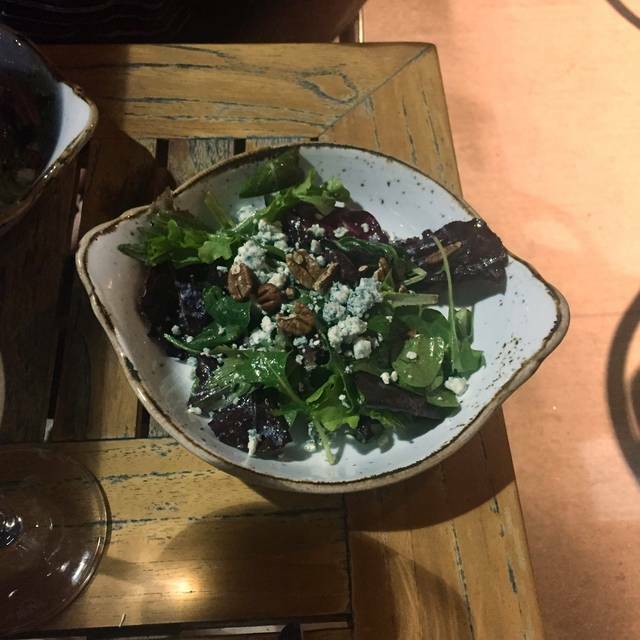 They have a great selection of shellfish as well as ceviche and I he tuna, along with other great main dishes, inventive salads and a selection of other appetizers. Plus they have a great happy hour during the week until 7 PM or you can sample some of their oysters at half price. 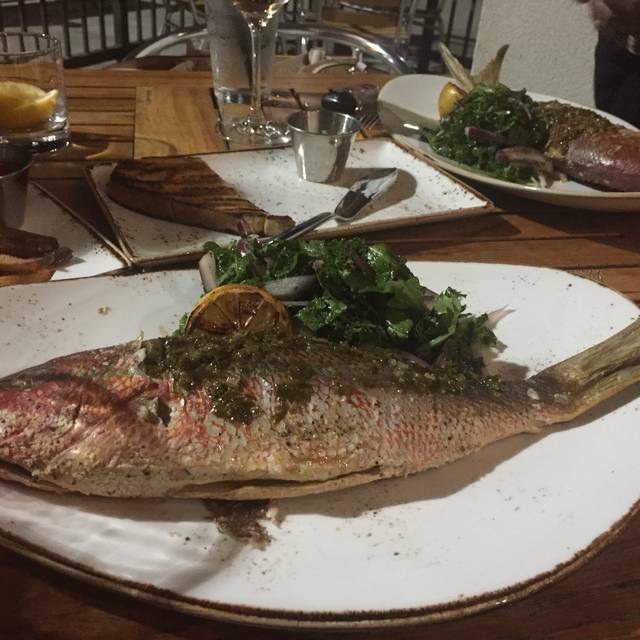 My wife and I dined at Rocksalt on a Saturday night. The first impression we had was that we had just entered a busy train station - huge open room with high ceiling. No sound deadening and extremely loud. Aside from the inability to hear or talk to one another the rest of the dining experience was fine - oysters on the half shell were excellent, main courses were very good, and wait service was excellent. Prices, overall were on the high side but fair for this area. If we do go back we will try to find a time when there is less of a crowd and less of the cacophony we experienced. Great food and service. Good to see a nice restaurant with a family environment. Fried oysters were outstanding - some of the best I’ve ever had! Stuffed Trout and Parmesan Scallops also excellent! We’ll definitely be back! The noise level was very comfortable. I’m not overly happy with places with booming music or talking so loud you can’t hear your companions. This was NOT a problem here. Oysters and seafood were great. Steak and chicken were over cooked. I would stick to the seafood on the menu. Wait staff was great. Ambiance was good. We enjoyed our dinner. Manager took care of us when we said something about the steak being over cooked. Food was worse than a public pool. For Valentine’s Day dinner we got the seared chicken option. It basically was just chicken tenders- but not even good ones! The oysters were good but the meal was not. We also got the tilefish which didn’t really have much a taste. The French fries were not special either. We should have paid tops $30 for this meal which cost $76. Would not recommend this place. The waiter was nice and that’s about it. We went to celebrate Valentine’s Day. We have been here before and love this place. True farm to table seafood, at least 4 types of oysters come directly from their oyster beds. They are the freshest you will ever eat! The crab cake was ALL crab meat, not what the binder was. The soup and husbands shrimp were delectable too! Love the waitress we get regularly, she is always kind and attentive. Best seafood around. Louisiana native, and this was my first time in Charlottesville. I was craving fresh seafood and had dinner here. It was amazing! The seafood is locally grown/sourced by the owner’s family. They have a variety of raw oysters that were absolutely delicious. I also had the gulf shrimp cocktail, crab cake, and steak, and it was all delicious. The only thing I did not like about this meal was the reduction sauce on the steak dish. I thought it was too sweet. Also, I don’t like sauces on steak in general. But the steak was perfectly cooked, well seasoned, and otherwise delicious. The service was amazing and the cocktails are southern-inspired, sophisticated, and stiff! If you’re in Charlottesville, give this place a try. This was our second visit to Rocksalt. Unfortunately, the food did not impress us once again. Both times the food arrived prepared differently than described on the menu. Tuna tartare was supposed to be mixed with scallions and served with fried wonton crisps - none of each. Waiter noted they changed the dish but had not updated the menu. It has since been updated online. Braised short ribs were tasty but had large pieces of fat. 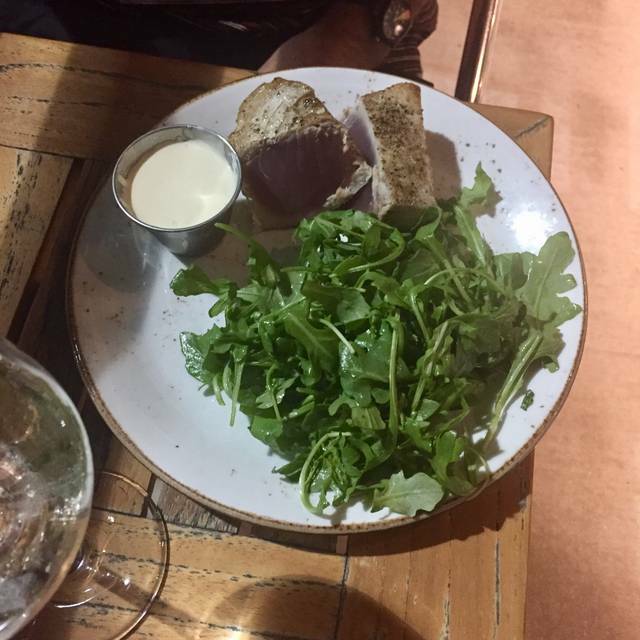 In a small plate serving that should have been caught. Oyster chowder was good. Server seemed new and unfamiliar with the menu. While the oysters both fried and on the half shell were excellent the rest of the meal was of poor quality. The crabmeat benedict came with a hard poached egg and almost no hollandaise sauce. The hanger steak made one of our party ill and was totally unappealing. Spinach was tough and overdone. The drinks were half price because the are only worth that. If they were crowded, I could excuse the poor service, but the place was empty except for three other tables. Overall, I won't be back. We had trout and baked oysters. Farly minimal pesentation effort, but quality seafood. Also, creative artisinal cocktails! Wine, however, was mediocre. A bare bones restaurant and raw bar, Rock Salt has an edg ambiance that makes for an interesting if not plush evening. Service was terrific. 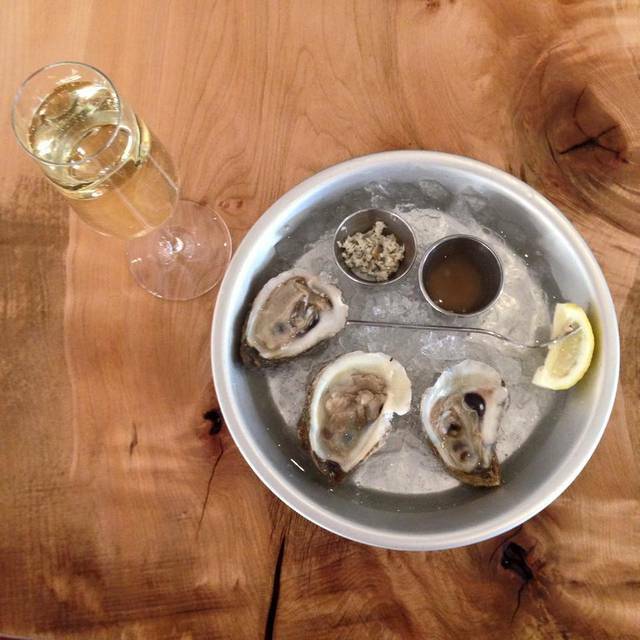 Rocksalt is one of our "go to" restaurants in Charlottesville! Always great food and service! The oysters are delicious with a good variety. We've always had excellent food here and good service. It's becoming one of our faves! Service was horrible. Wait staff were rude. Seemed completely uninterested. Food was undercooked had to send back. Fries were cold when they came to us. Overall it was not a good experience. Good choice for seafood. Oysters were the best. Very fresh Virginia oysters served with freshly grated horseradish. The crab stuffed flounder entree tasted a little fishy. Swordfish was good, but the bed of rice it was served on lacked flavor. We visited for Restaurant Week. When the entree came out, it sat on a bed of cold rice. We told the waiter, who quickly replaced it with another plate, but the rice on that plate was cold too. Finally got some hot rice when they brought it in a bowl. They made good, but disappointing experience. We went to Rocksalt for Restaurant Week. We had been before, but had been underwhelmed by the food. But the Restaurant Week menu looked good, so we thought we’d give it another try. My starter was sautéed scallops - they were very good, far and away the best part of the meal. The crab stuffed flounder was very disappointing. Flounder seemed a little undercooked, the plate was cool, as if it had been sitting a while. Presentation was lackluster. Didn’t finish it. 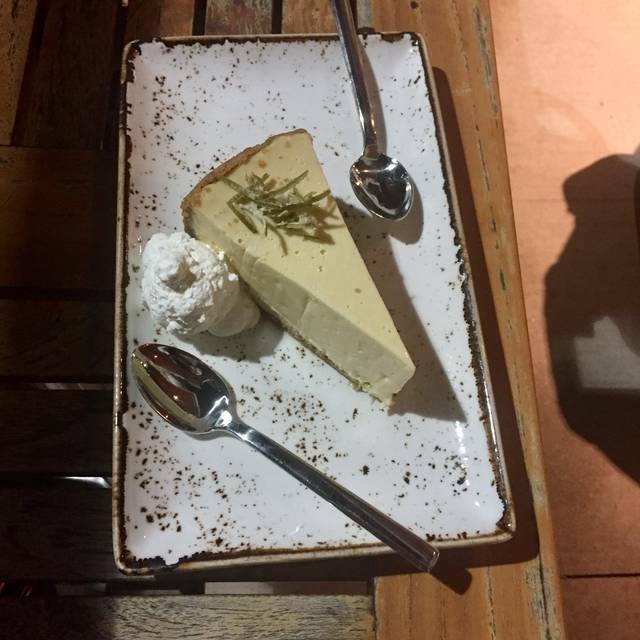 Dessert was a key lime tart. Good flavor, but the presentation in a small aluminum tin was not attractive. It definitely had the look of something mass produced, and was an ungenerous size. Although there were few people in the restaurant, service was slow. We won’t be back. We visited for the first time during Restaurant Week. 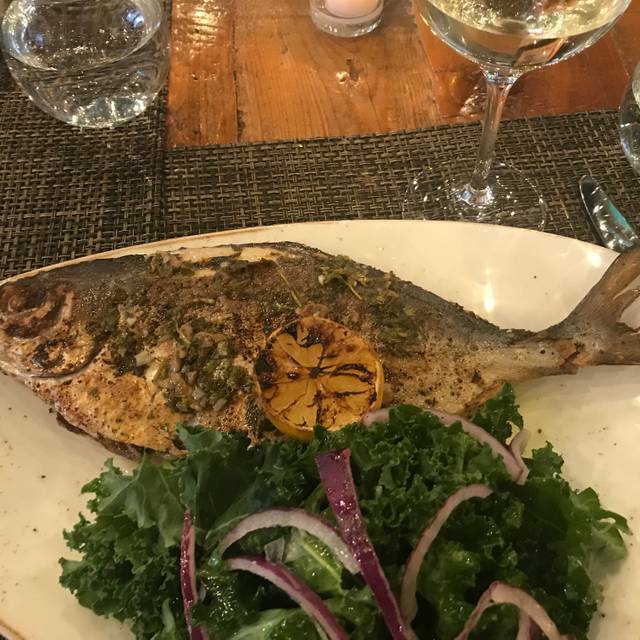 The food and service were excellent and I’m not a big fish eater. It was a frigid night outside so the draft from the front door was a bit uncomfortable. The restaurant is sparsely furnished and not eye appealing to me. Who cares, the food made up for it. We went for restaurant week. Everything was delicious. Service was excellent! Best seafood in town. Great service. Terrific place to meet up with friends for a casual meal. Only complaint is the decor. Would love it if the floors were hardwood. The look and feel (poured concrete floors) is cold and sterile. Very pleasantly surprised. Went because of the restaurant week specials. Great eggplant parm for my wife and swordfish for me. Excellent. Great appetizer and dessert included. Outstanding service! Environment pretty simple, nice, but not special. Will definitely go back and recommend to others. Oysters fresh and delicious. Scallops good but only two for $15 -disappointing. Rest of the menu uninspiring. Service excellent. Wouldn't go back except for the oysters. Great oysters! Great vegetarian dish. Fast seating. Clean restrooms. A little more expensive than other options in the area. Half priced oysters on Sunday evenings helped with cost. Would have liked to seen more dessert options. We walked down the street and ordered dessert elsewhere. The staff is extremely courteous, enthusiastic and well informed but the recipes and execution struck me as mediocre. I will not return nor will I recommend Rock Salt to anyone I know whose notion of value-to-price resembles my own. BoneFish is much, much better in all respects. A group of three, we were the first party to arrive on New Years Day, so it was quiet. The drinks were great, and the food (especial the crab sandwich) was fantastic. Great service, friendly staff. The decor is industrial and chic at the same time. I will certainly return; just from the layout, menu, drinks, and beer offerings I’m sure Rocksalt can get lively and fun! The food and the service were excellent, as usual. They've added some variety to the menu with some winter specials, which is a welcome addition. Food was tasty, but the linguini was too salty for my taste. Service was good. Waitress had a great sense of humor, was personable, polite, prompt, attentive. Seats were hard on the posterior. A most enjoyable Christmas Eve dinner. Oysters were Happy Hour prices! Always enjoy a meal @ Rocksalt. Love the oyster selection here. Waiter was knowledgeable about oyster recommendations! Cool ambiance! 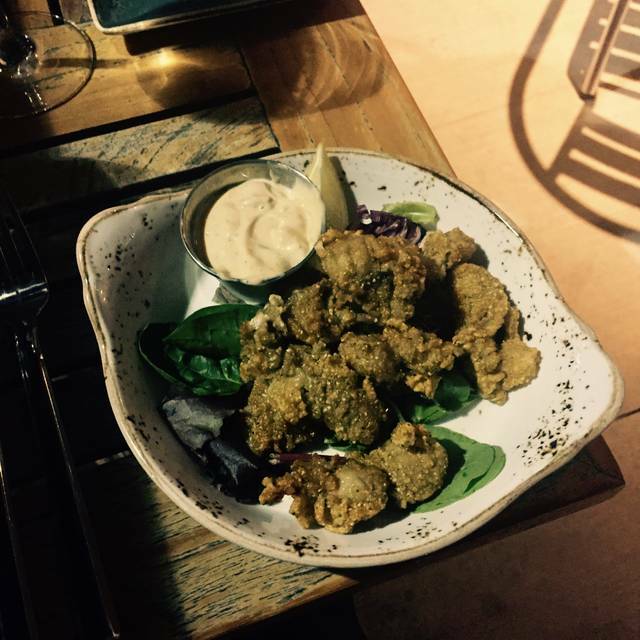 We stop by RockSalt whenever we come to town because we love the fried oysters. The oysters did not disappoint but the braised beef short rib literally left a bad (after)taste in my mouth. The consistency was that of boiled meat, not braised. The meat tasted like an after thought, thrown and mixed in at the end. Everything else in the bowl was delicious except for the meat. Other than that, our experience was pleasant, as usual. Really enjoyed the raw clams and fish special, but my wife had the beef short ribs and they were outstanding. Especially for a seafood and raw bar establishment. Great food! 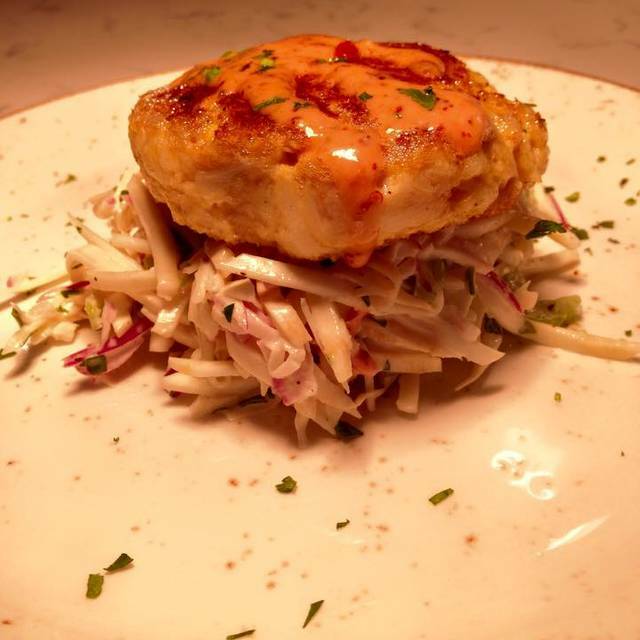 Crab cakes are amazing! It was a nice meal but staffing seemed thin, so service suffered a bit. Great oysters and knowledgeable wait staff about the different kinds of oysters. Fun bar area and great drinks. Very nice menu! Absolutely a fantastic experience! food was great ,really good craft beer selection ,handcrafted cocktails,Raw shucked oysters are outstanding! Service was spot on perfect .you couldn't ask for more .We will be back! Food very overpriced for quanity, green beans were cold, oysters were overcooked. Wait staff were excellent and food was served fast. We are senior citizens and we found it very noisy. Rocksalt was jam-packed when my party of six visited, which slowed down the kitchen. Our waiter informed us of that in advance (and you could see via the open kitchen that the kitchen team was working hard). When the food arrived it was pretty good, although some of the portions were a bit on the small side. Sides of roasted vegetables didn't seem to be roasted all that much. The place overall was fine, but I wonder how much better it might be on a night its staff wasn't overtaxed.